In case you hadn't noticed, I have a bit of a fixation with circles. In the last two years I’ve made 4 circle quilts. In that time I’ve figured out an easy, reliable way to make even circles – circles that are actually round, that are easy to appliqué, and that don’t have points or tucks. To get to this point I’ve tried a number of methods: dryer sheets, cardboard templates, plastic templates, aluminum foil, and fusible appliqué. I was never satisfied with any of these. It was either difficult to keep the fabric in place when drawing up the circle (with cardboard and plastic templates), the circles had points or tucks (with all methods but fusible appliqué, determining the center of the circle wasn’t always easy, or you had to use a satin or decorative stitch to finish things off neatly (with fusible appliqué). There is nothing wrong with any of these methods and I’ve heard that people have success with them, but I sure wasn’t one of them. Here is my nearly full proof method for creating and attaching perfect circles. 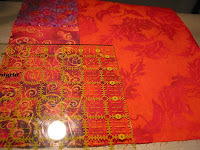 This method works for machine or hand appliqué. The diameter of the circle is the distance from one side to the other. This is how big your circle is. The radius is half the diameter, or the distance from the center to any one point on the edge. The circumference is measurement of the outside edge of the circle. Determine the size of circle you want. 1. 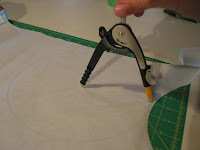 Using the compass, draw a circle the desired size on the rough side of the freezer paper. Make sure the point of the circle is noticeable or re-mark it with a pen. 2. Cut out the circle right on the drawn line. Take care to use long, even cuts in order to minimize any sharp edges or points on the drawn circle. This is your freezer paper template. 3. 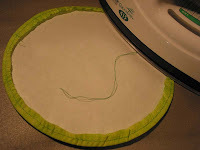 Place your circle fabric wrong side up on an ironing board. Ensuring that you have roughly a ½ inch seam allowance, iron the freezer paper smooth side down to the fabric. 4. 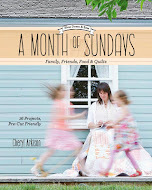 Cut out the circle of fabric, with the freezer paper template as a guide, with roughly a ½ inch seam allowance. I use my machine for the next step because it is faster, but this can also be easily done by hand. If you do this step by hand, try to take small basting stitches. The larger your stitch length, by hand, the greater the chance for points on the finished edge. 5. 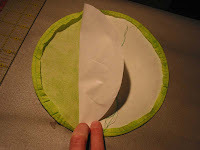 Sew a basting stitch about a ¼ inch from the edge of the freezer paper template all the way around the circle. Leave the ends of your thread a few inches long. Do not backstitch or sew over the ends, you want these free. 6. Gently tug on the loose ends of thread. Short tugs seem to work better. 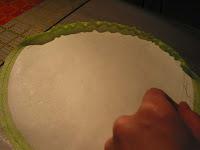 This will draw your fabric edges over the freezer paper template, creating a turned over edge. You may have to work the gather a little, but provided you don’t pull sharply or too hard the threads will hold and you will get a pretty smooth edge. 7. Steam iron the gathered edge. Some people may choose to use starch at this time, but I’ll admit I never have. A hot iron does a good job of holding the edge well. 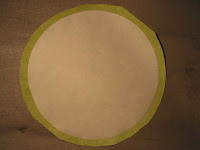 If you are attaching the circle right away, the freezer paper template can be removed after the following step. 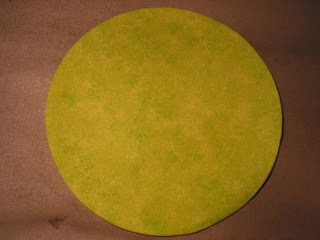 If you are waiting to attach the circle, keep the freezer paper attached until ready to use. The following steps apply if you are attaching the circle in the center of a square block or precise design. If you are doing this as part of a relatively random design, then simply remove the freezer paper prior to appliqué, pin, and sew. 1. 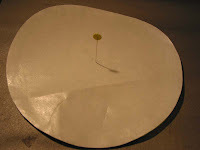 Place a pin through the center of the freezer paper template (fabric and template should still be attached). This provides an extra mark for the center of the circle. 2. Remove pin and freezer paper, taking care not to rip the paper. If pin mark is still visible in fabric, replace pin. 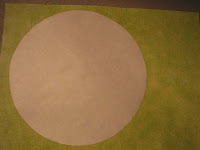 If it is not visible, then place template over circle to mark center again. Pull template off, leaving the pin in place (it’s okay if the template rips at this time, it’s easy to make more). 3. Mark the center of your block or design (where the center of the circle will go. 4. Place the circle, with the pin still marking the center, directly over the marked spot. Line up the mark and center point, then complete pinning. 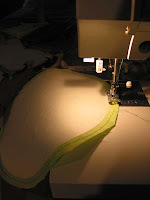 I use my machine to appliqué most of the time – a small blanket stitch in a coordinating thread. You could hand appliqué, use invisible thread, or do a decorative stitch. I would not recommend a satin stitch at this point – you have a seam allowance so there would be a lot of fabric under the stitching. Thank you for sharing- I'll have to try this out when i get a chance! Thanks. I just did this the other day without the freezer paper and it has points. I made a yo-yo then smoothed it out. I am happy to know this can be done on the machine too. Maybe I won't be so scared of applique circles now! I came across you blog, and I love your work! Thank you for this awesome tutorial, I'm going to try it on my next project. I'm just outside of Edmonton, AB. 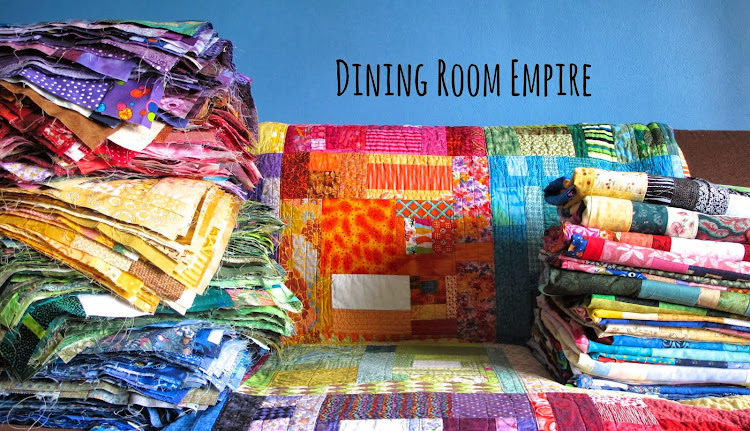 Do you buy your fabric locally, online, or..? Great tutorial! I'm going to try it. Yay! Thank you, thank you! 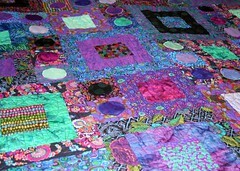 I SOOOO want to do circle quilts but have been scared to try. . . I think this might work! 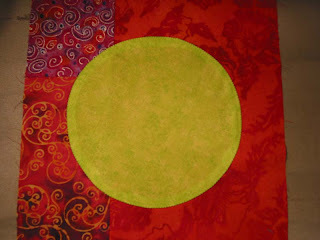 LOVE, LOVE, LOVE your circle quilts! 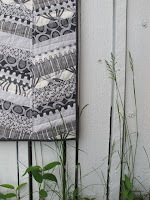 Cheryl, I came back to this tutorial to gain some insight on fabric appliqués. I have an idea for a quilt design and it is all appliqué basically. Also, each shape is different. What would you suggest? Should I just do fusible web? Should I try and do a gathered edge even if the shape isn't a perfect circle? Should I just chuck the idea? Thanks for a great tutorial. I've been trying to get good circles and have been trying the methods you mentioned without much success, but yours sounds really promising. Do you leave the basting stitches in or do you pull them out before you applique? I cannot wait to try this! You have me wanting to jump right in and make circles. Thanks for the great tutorial. 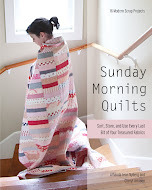 I just used it for a quilting bee I'm in and it worked perfectly. If you place the freezer paper waxy side up on the fabric instead (one pin in center) you can just iron the edges to the paper and that's it. The basting step is eliminated. I found it faster and easier this way. Try it. You might like it. Ack!!! this tutorial is perfect!! i can't tell you how many times I burnt my fingers on the tinfoil ironing it down. Thank you!